Last year, Apple added the Control Center to iOS 7 which gave users with quick access to toggles such as WiFi, Bluetooth, brightness settings and much more. However, it was not customizable so users could only access the settings provided by Apple. It seems things may change with iOS 8, which is expected to hit the devices this fall. According to a new report, the future ios 8 update could give users the ability to customize the control center. This means users will be able to change the order in which the icons are displayed. Users will also be able to select which shortcuts are displayed in the Control Center. 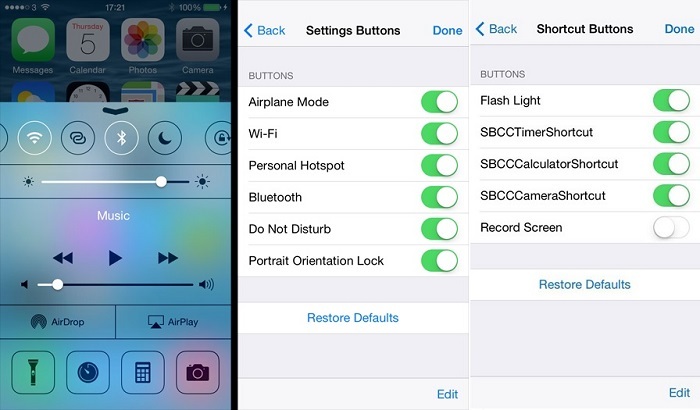 There’s no word if Apple will introduce the customizable control center in the iOS 8 update, but Hamza Sood, a Twitter user posted some screenshots which shows a rearranged Control Center, as well as a settings screen which lets users add/remove a specific application from the Control Center. Other improved features introduced in iOS 8 includes improved notification center, access to recent contacts in the multitasking screen, ability to read and respond to messages/calls from iPad or Mac, improved spotlight search and much more. We’ll update you as soon as we get more information about the customizable Control Center and if it will make its way to iOS 8. Until then a grain of salt is required. If you’re an enrolled developer using iOS 8 beta 1, share with us using the comments below if you spotted a new feature.